Are you looking for a professional to clean your concrete in Indian Rocks Beach Florida? The painting professionals at Richard Libert Painting Inc. can help. Whether you have a concrete or aggregate driveway or walkway, keeping it clean can help improve the overall curb appeal of your property. However, many homeowners aren’t sure where to begin when it comes to concrete cleaning in Indian Rocks Beach, and many of the products available at your local home improvement store are not powerful enough or not safe. Instead of risking an ugly driveway or wasting time or money on ineffective products, consider hiring Richard Libert Painting Inc. to perform your concrete cleaning and Indian Rocks Beach concrete sealing tasks. Simply call (813) 419-1600 for a free quote. Why Clean My Concrete in Indian Rocks Beach? While concrete provides a durable surface, it’s also porous, which means that is can stain easily. Dirt and debris can get stuck inside the material. For instance, if you have a car dripping oil, the oil can penetrate the concrete pores and leave a stain. The Indian Rocks Beach concrete cleaning professionals at Richard Libert Painting Inc. will work to remove these stains and make your concrete look new again. What's more, we can apply a concrete sealant to decrease the staining to your surface. Once your concrete surface has been professionally cleaned, Richard Libert Painting Inc. can also help keep it looking that way. 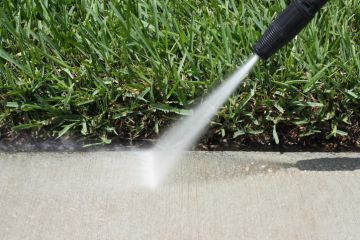 We do this by applying a concrete sealer on it to help eliminate buildup dirt and stains from seeping into the concrete. If a car were to leak oil on a concrete driveway that’s been sealed, the oil will not easily penetrate the surface and will be more easily washed away. Sealing a driveway, however, is more than just wiping on a product from Home Depot. There are different sealers for different needs, and Richard Libert Painting Inc. can assess you needs to ensure you’re getting the right sealer for your driveway, no matter if it’s concrete or aggregate finish. Richard Libert Painting Inc. has been cleaning and sealing driveways in Indian Rocks Beach as well as other concrete surfaces since 2002. We've mastered the science of concrete cleaning and sealing and we know a thing or two about giving your curb appeal an upgrade! With more than 17 years in business, you can trust Richard Libert Painting Inc. to make your driveway, walkway or patio the envy of the block. Contact us today at (813) 419-1600 to schedule your appointment.